Spring has sprung up here in Michigan! Temperatures are rising and so is my desire to run longer and faster. I've done two 5K races already this year, and I've got a wish-list of races that I want to sign up for. But first, I have to rehab my right knee. It's super sore right now. I'm not a doctor or physical therapist, but I have a basic understanding of the muscles—I can tell that my pain stems from a tight one. As you can tell by the picture, the sartorius muscle inserts on the medial side of the knee—where my pain is. If the sartorius is tight, it will pull on the knee joint and cause pain and pressure. 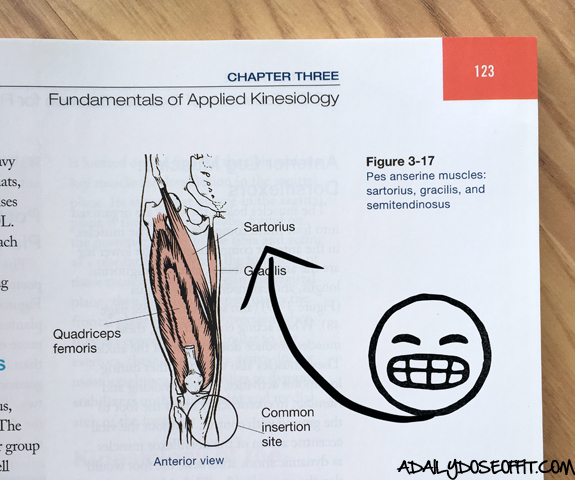 That said, I supposed I could also have a problematic gracilis muscle. It also inserts on the medial side of the knee. And then there's always the quads and hamstrings. So, who knows really. It's something. It started after an indoor 3-mile run. I did my second mile on the treadmill at an incline, which I don't normally do. So I think the hill tightened everything up. That's my theory and I'm sticking to it (for right now, anyway). What's the pain like? Dull, achey tightness. Nothing sharp, no swelling or bruising, which is also why I think the underlying cause is a tight muscle. At the time, I thought it would go away so I went about my business. Read: Classes, yoga, stretching as per the usual. I don't think it got worse, but it certainly didn't get better. Because: I signed up for the Soldier Field 10 Mile Run in Chicago on May 27th. Stupid? Maybe. I don't know. I ran six miles this Sunday and it felt really good. It's the aftermath that killed me. Which, again, I'm taking as further proof that something is tight. Don't worry (mom), I'm being smart about this. 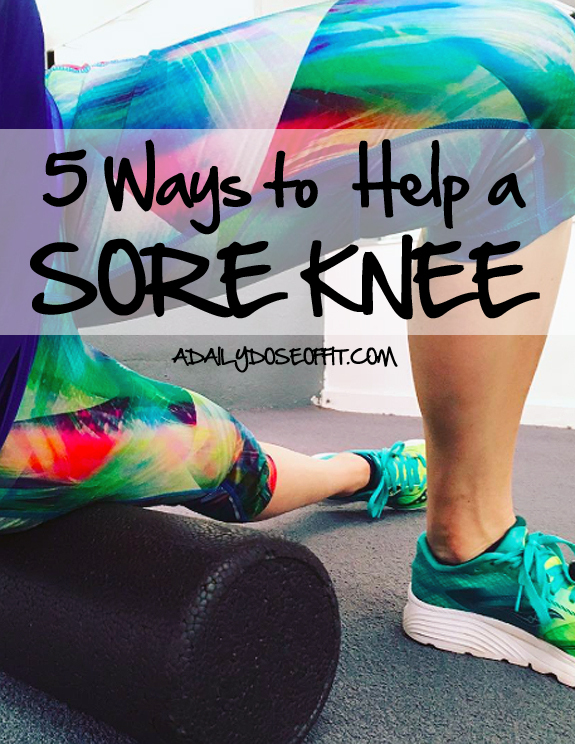 Got a sore knee? You should be smart about it, too. 1) Rest and modify as needed. I've been modifying my classes this week. Read: I haven't been doing any of the leg work. If something hurts, giving it time to rest is best. 2) Hop on a foam roller. 3) Check out your shoes. 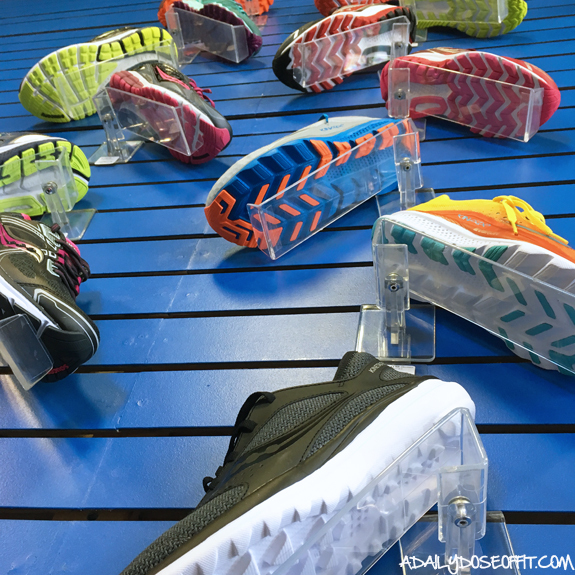 Running shoes should be replaced every 300-500 miles, depending. If you suddenly develop problems out of nowhere, it could be that your shoes aren't cushioning or supporting your feet anymore. A potentially easy fix, right? 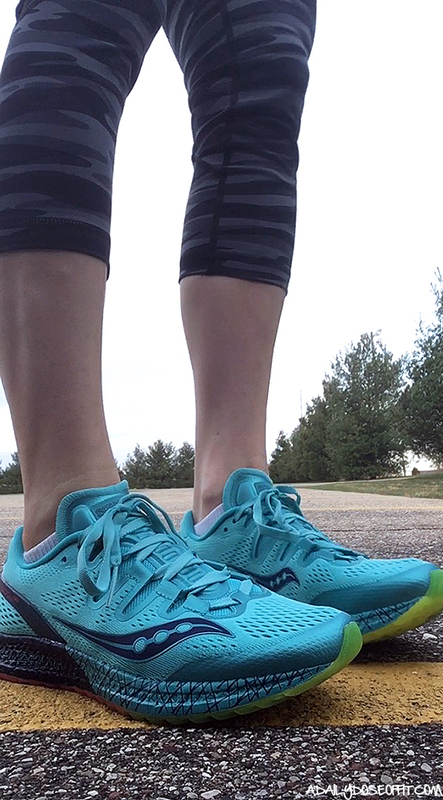 I just purchased a pair of Saucony Freedom ISO shoes and my Kinvaras are still pretty decent, so in my case, I don't think this is the issue. I also bought some epsom salts. 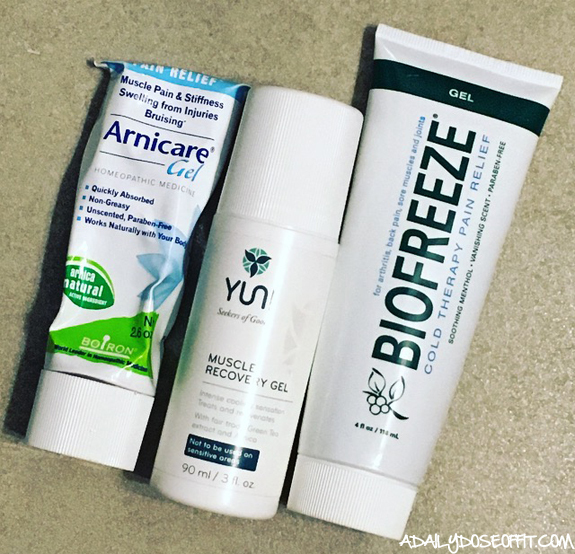 Verdict is still out on their ultimate effectiveness, although I did notice my legs feeling better in the hour or so after my bath. And, you know, it was a good excuse to sit in a hot bathtub for 20 minutes. Bottom line, you need to respect what your body is telling you. If these easy methods of pain relief aren't working, you need to take it a step further and get an assessment from a qualified physician. Don't mess around with a nagging pain, friends. Question: What do you do when you've got a sore spot? Ever have knee issues? How did you make them feel better? What's your take on Epsom salt baths? There's something so incredible about the concept of running. It harnesses two of our greatest human sensations: fear and pleasure. In a book appropriately titled Born to Run, author Christopher McDougall explores this concept. "We run when we're scared, we run when we're ecstatic, we run away from our problems and run around for a good time," he writes. And he's right. We run. All of us. Some of us do it for fitness reasons. If it isn't, that's perfectly fine. Running isn't the only worthwhile of exercise. But if you want to make it your exercise of choice, then I encourage you to begin. Take that first step, maybe two or three, and see how running make you feel. 1) Running is hard, and it always will be. Consider it a beautiful challenge. Running will constantly push you above and beyond your limit, taking you in and out of your comfort zone every time you lace up. 2) Two steps count, so does a mile or a marathon. Running can be a team sport, but it's very much an individual battle. It's you, your feet, the road ahead and your determination to rise above what you did the day before.Therefore, every step counts. 3) Forward is a pace. Running is often associated with racing. To some runners, pace (how fast you run) is everything. To others, it doesn't really matter—and that's perfectly fine—because forward movement of any kind will always generate progress toward the end result. Once you embrace running and all the joys it can generate, it can very easily become that one thing you need to do every single day. BUT—you must rest. The physical aspects of running will challenge any body, and you need to honor yours at all times. So don't deny yourself a rest day when you need it. 5) Good shoes make all the difference. One doesn't need much to run. 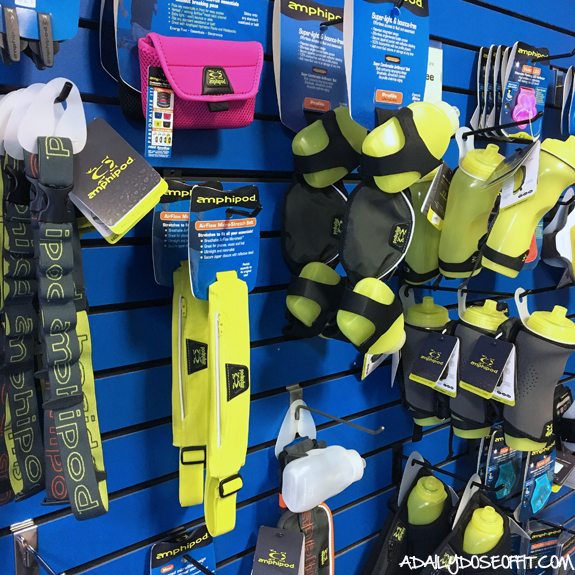 sure, you can find a wide variety of accessories that will enhance the experience. 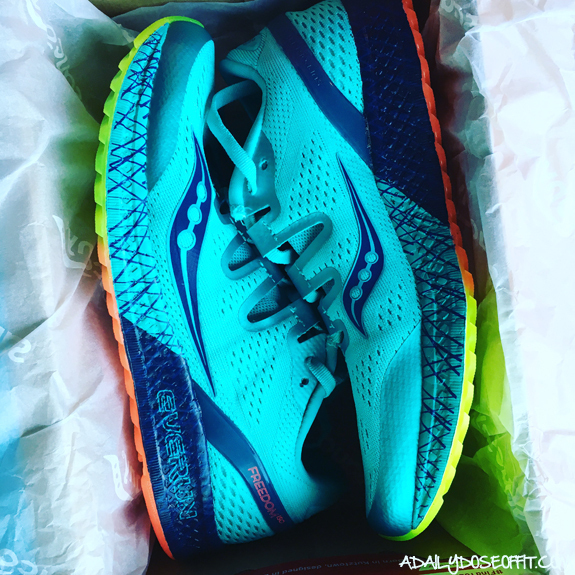 Realistically, there's only one thing you truly need—great running shoes. So invest in a pair that makes your feet happy, because when your feet are happy, the rest of your body will be, too. And therein lies the beauty of running. You can always find joy in the journey. 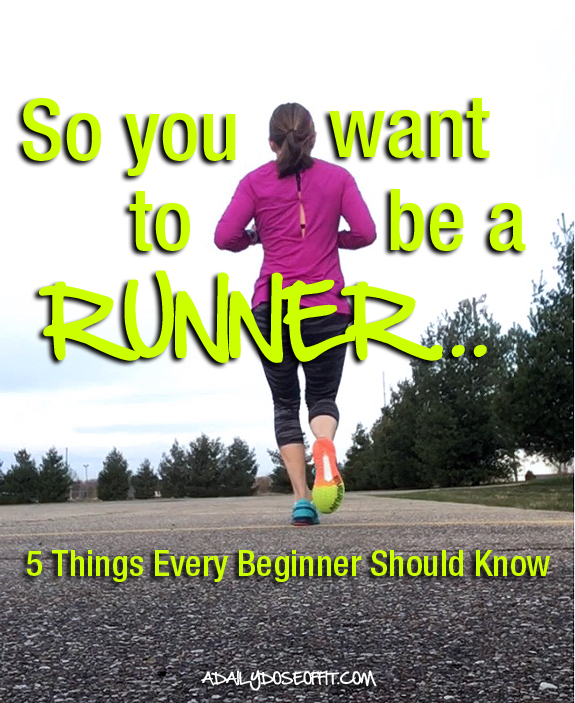 Question: Are you a runner? Why do you run? I worked a lot of retail in college. I started off at American Eagle Outfitters, after which I went to Bath and Body Works, then Abercrombie and Fitch. When I finished school, I moved on to my first job in advertising, but worked a few hours at Express to fund the professional wardrobe. Truth: I hated that job at Express, so I quit retail and focused on my advertising career, which lasted for seven years before I decided to start a fitness career. While I made the switch to fitness, I worked at a local boutique. But only for one Summer. Fast forward to today: I've been in the fitness industry for almost seven years now, and I'm not leaving it anytime soon. I'm going back to my roots in the retail industry. I'm running a running store. No, I didn't quit my job at the gym. I am still the fitness director, also a personal trainer and group fitness instructor. That was, and still is, my primary part-time job. I just added another 15 hours a week to my life with this new position at the running store—managing partner, officially. I have been tasked with revamping a dying running store that has buckets and buckets of potential. Don't worry, I'm not in it alone. My partner is my running buddy, also a personal trainer on my team at the gym. Neither one of us could do it without the other. We wouldn't have the time. But together, we can be the type of manager the store needs. And we are so excited about that. Also, we're like Willy Wonka in his chocolate factory. We are literally surrounded by shoes (and desperately trying not to buy them all). We are meeting left and right with shoe reps. We've checked Saucony and Mizuno off the list, and are anxiously awaiting our scheduled meetings with Brooks, New Balance and TOPO. Guys, it's so much fun. But, it's so...so much fun. This is a different type of retail job than I've ever had before. I'm not following corporate rules and punching a clock. I'm making something, a new environment for every local runner in my town. My partner and I are full of ideas. We have a vision, and we cannot wait to bring it to life. We are fairly stocked with all the essentials, but we see room for more. I'm learning so much about running shoes. I'm even getting sneak peeks at shoes that aren't out yet. Really, though—I'm helping people find shoe love, and in doing so, I'm making connections in the community. And that's what we hope to do with the store. We want to reconnect it to the community. My partner and I are (hopefully) going to make this store a hub of running activity. This community we live in, it's full of runners. My town is an active town and hopefully this store will be a bigger part of that. Again, it's hard work, but I'm loving it. And I'm so grateful for this new opportunity. Question: Do you have any retail experience? What stores have you worked at? 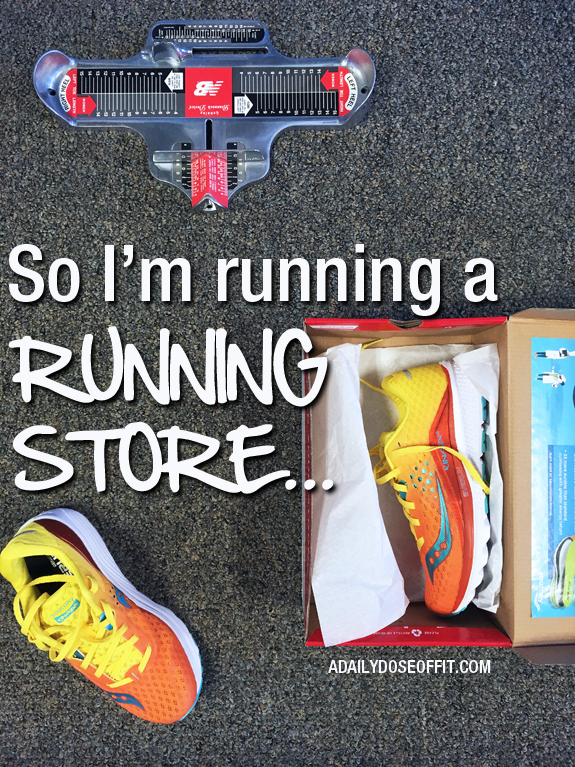 If you frequent a local running store, what makes you go there versus websites on the Internet?